Get Podcast & Radio Interviews as a Featured Guest Expert Sponsor! - Radio Guest List.com - How to Get Radio Interviews and Find Podcast Guests! 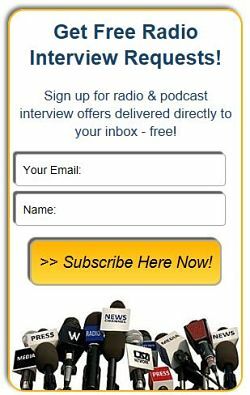 Get Podcast & Radio Interviews as a Featured Guest Expert Sponsor! The most cost-effective podcast and radio interviews promotional service anywhere, our exclusive sponsored "Featured Guest Expert" publicity campaigns professionally showcase your expertise and are GUARANTEED to get you podcast and radio interview publicity. Complete the easy online form below and we'll share YOUR Featured Guest Expert profile with our worldwide audience of radio, podcast, TV, and satellite radio bookers and producers! Posting as one of the Featured Experts on the Featured Guest Experts Sponsors page on the RadioGuestList.com web site for 30 days. A custom-produced Featured Guest Expert profile page of your own with your full profile, expertise details, contact info, and photo(s), plus links back to your own web site. 1 post to both our popular Facebook and Twitter accounts, too. $229 set-up fee plus $29/month listing fee. TWO postings to both our popular Facebook and Twitter accounts, too. $349 set-up fee plus $29/month listing fee. The PRO Featured Guest Expert package offers all the benefits of the Featured Guest Expert packages above, but with FIVE sets of the email and social media blasts detailed above. That's another publicity email and social media blast EVERY MONTH for 5 months if your $29/month listing subscription remains active. This includes THREE big publicity email blasts to the Show Hosts & Producers list, plus TWO email blasts to our largest general email list, too. That's FIVE big email blasts, blog posts, newsletter ads, and social media pushes spread over 5 months for powerful, repeated, on-going publicity on our website, in our emails, on Twitter and Facebook, too. See examples of Featured Guest Expert placements here. You can cancel the recurring charge and have your listing removed immediately simply by emailing us. But it is recommended that you keep your Featured Guest Expert page live as long as possible so it can help you attract more interview bookings and improve your own web site's SEO search engine optimization. Also, any unsent email blasts will not be delivered if you cancel before they have all been sent. p.s. Questions? Just email us at ads @ radioguestlist.com. - Please submit finalized, clear, well-written material with no typos. - We may edit your submission for clarity, style, and length. - This is a web and email based service only - not a print publication or newsletter. - Advertisements accepted and scheduled at our sole discretion. - Placements are posted and emailed on a first-come first serve basis. - Payment due in advance via credit card (Paypal). - $29/month listing fee is in addition to set-up fees. - Additional editing fees may be charged for changes to listings requested after publication. - When you cancel your billing agreement, your placement will be removed from the site and any remaining future email blasts will be cancelled (not at the end of the monthly billing cycle). - No refund for set-up fees or unsent email blasts for any early cancellation. - You warrant that you own all rights in any images or content you submit to us for public posting and that you release us from any and all liability associated with your use of our services. - It will take us 3-5 business days to produce and post your listing. Initial email blasts will then be sent in the subsequent 30 days. Already completed the form and just need to pay? Make payment here now, please. p.s. Sorry but these packages and prices are not open for negotiation, although our pricing does change occasionally depending on demand. If you're looking for publicity and interviews, please book your sponsorships today to ensure best availability. a Featured Guest Expert sponsor!